Hei, melkoinen lumimyräkkä eilen! Meillä on tullut 15 cm lunta ja lisää tulee! Tunnelmaan sopiva kortti, tämä käy vaikka talvisynttäreille, koska siinä ei (vielä) ole mitään tekstiä. Hi, we got snow yesterday and it's still snowing. The day's card has no sentiment (yet), so it goes for winter birthdays too. 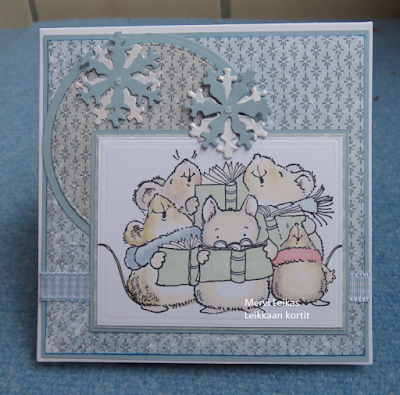 Perfect for a winter birthday, Mervi, love these little mice! Thanks for joining us at the Simon Says Stamp Wednesday challenge! Love the stamp! Such a cute card! It's adorable and I love that It can be used for Christmas or other occasions as well, it's all up to your color and sentiment choices. Leaving one out makes it really flexible. What a cute image, and I love your soft pastel colouring. So cute and beautiful card! Thank you so much, Mervi, for joining the challenge at Crafts Galore Encore that we are sponsoring! Good luck with your entry!